Following is a list of some of the Alaska tokens which we have for sale now. We try to keep enough of an inventory on hand to please those at all levels of collecting. During the past twenty-five years we have bought more than $600,000 in tokens to further this goal.Please note that some of these tokens we may have only one of so they are subject to prior sale. We will, however, try to keep this list up to date as much as possible, removing the tokens which have been sold and adding others. 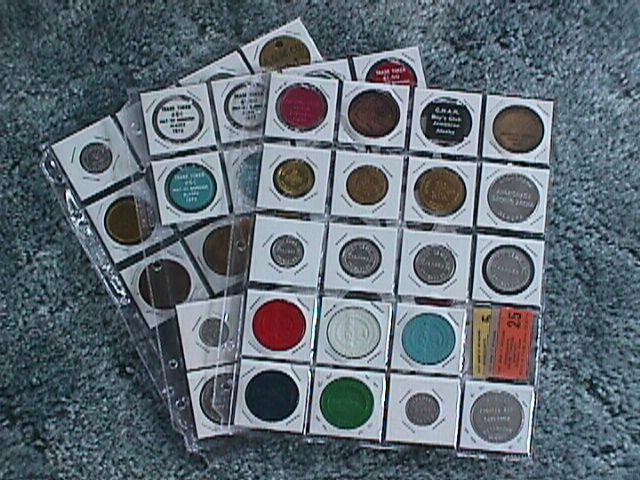 24mm aluminum token good for 10c in trade at the S.M.&D. Lucky Spot, Ketchikan, Alaska. $15.00 postpaid in the USA. Set of three 39mm encased 2008 Alaska quarters, one with brass ring, one with copper ring and one with aluminum ring. These were issued by Kaye Dethridge in 2009 to celebrate 50 years of collecting and dealing in Alaska tokens and 50 years of Alaska statehood. $15.00 postpaid in the USA. Four-piece set of tokens issued by the Teller Commercial Company of Teller, Alaska. Denominations are $1.00, 50c, 25c and 5c. $30.00 postpaid in the USA. Set of 4 tokens issued by the Union Club, Anchorage, Alaska. Denominations are 50c, 25c, 10c and 5c. $20.00 postpaid in the USA. Group of 50 Alaska trade tokens and medals, some pre-statehood, some post-statehood. No wooden nickels. $45.00 postpaid in the USA. 28mm bimetal token good for 25c in trade with Edw. C. Willis, Long, Alaska. 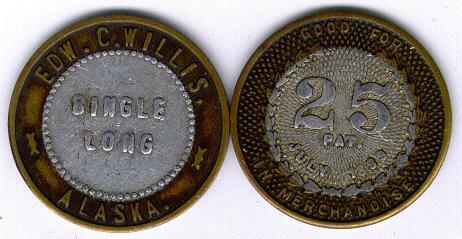 One of the few Alaska tokens with the term "bingle" on it. $40.00 postpaid in the USA. 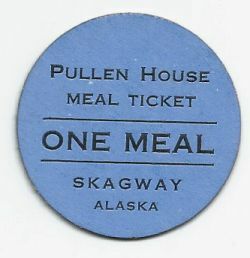 32mm x 54mm blue cardboard token good for 1 Quart of Milk at Creamer's Dairy, Fairbanks, Alaska. $7.00 postpaid in the USA. 25mm brass token good for one drink at the Carousel Lounge, Spenard, Alaska. $8.00 postpaid in the USA. 38mm yellow cardboard token good for 10c in trade and 38mm blue cardboard token good for 5c in trade at OK's Place, Petersburg, Alaska. Tokens are bifacial (same on both sides). $35.00 postpaid in the USA. 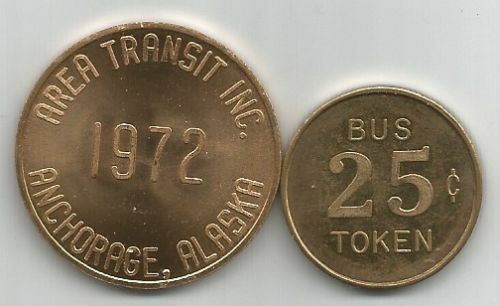 24mm bimetal token good for 50c in trade at the Northern Drug Co., Cordova, Alaska. Really nice old token. $35.00 postpaid in the USA. 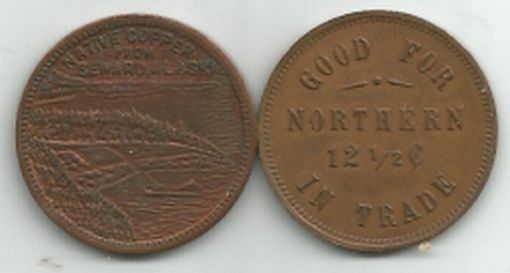 28mm native copper token good for 12 1/2c in trade at the Northern, Seward, Alaska. This is the Type III token. $30.00 postpaid in the USA. 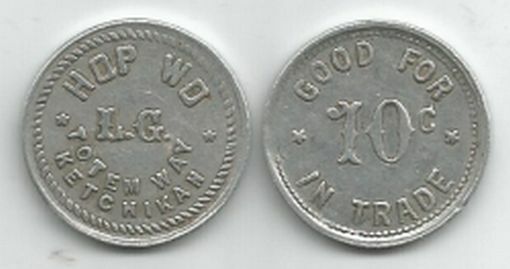 24mm aluminum token good for 10c in trade with Hop Wo, Ketchikan, Alaska. $60.00 postpaid in the USA. 3 21mm aluminum tokens good for 12 1/2c in trade with Perry Hern, Skagway, Alaska. These are three varieties of reverse. Scan shows four tokens just to show obverse also. $12.00 postpaid in the USA. 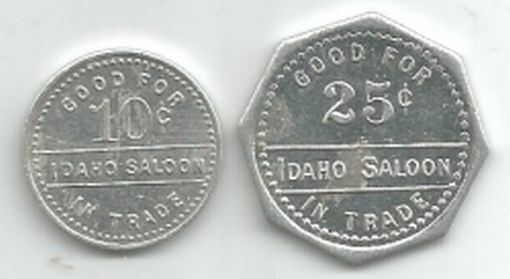 Two tokens from Idaho Saloon, Skagway, Alaska. 10c (21mm) and 25c (27mm) These tokens are the same on both sides. Nice gold rush era tokens. $30.00 postpaid in the USA. Three 38mm cardboard tokens good for 12 1/2c at the Bingle Club, reportedly from Ketchikan, Alaska. Red, orange and pink. These were found in the wall of the Redman's Lodge in Ketchikan in 1984 during a remodel. All of them are quite dirty. $45 postpaid in the USA. 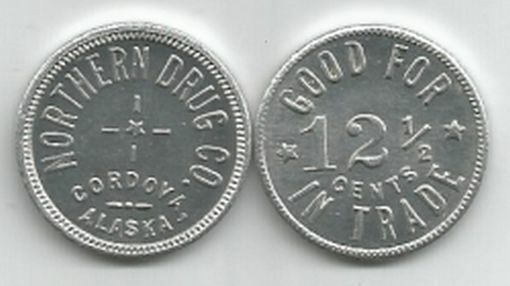 23mm aluminum token good for 12 1/2c in trade at Northern Drug Co., Cordova, Alaska. $30.00 postpaid in the USA. 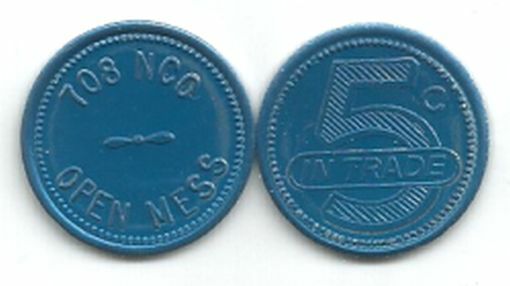 21mm blue aluminum token good for 5c in trade at 708 NCO Open Mess, Indian Mountain, Alaska. $8.00 postpaid in the USA. 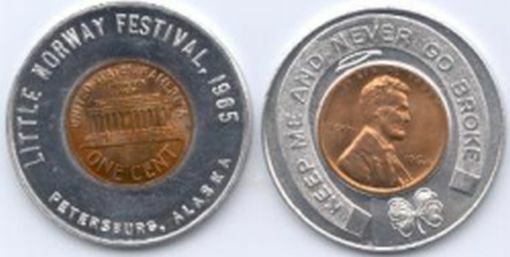 35mm round aluminum 1964 encased cent issued for the Little Norway Festival, Petersburg, Alaska, in 1965. $15.00 postpaid in the USA. 3 40mm medals commemorating the building of the Trans-Alaska Pipeine from Prudhoe Bay to Valdez, Alaska. 1973. One nickel, one bright brass and one oxidized bronze. $15.00 postpaid in the USA. 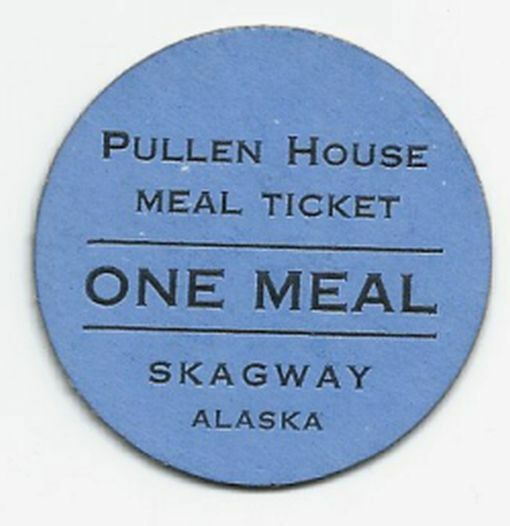 38mm blue cardboard token good for one meal at the historic Pullen House, Skagway, Alaska. Reverse is blank.$8.00 postpaid in the USA. Two tags 35mm and 38mm, from the A.G.M. Co. (Alaska Gastineau Mining Co.), Thane, Alaska. Blank on reverse. $8.00 postpaid in the USA. Two brass bus tokens from Anchorage Transit, Inc., Anchorage, Alaska. 25mm 25c and 34mm 50c. $8.00 postpaid in the USA. 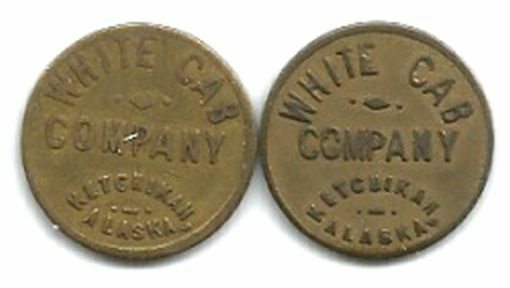 Two 17mm brass tokens each good for one stage fare with White Cab Co., Ketchikan, Alaska. These are two varieties, one has wide word "Company," the other has narrow word. $8.00 postpaid in the USA. 2 inch x 5 1/4 inch complete $25 scrip book from Fisherman's Co-op Trading Company, Dillingham, Alaska. $12.00 postpaid in the USA. 2 inch x 5 1/8 inch complete $5.00 scrip book from 449th Airman's Club, Ladd Air Force Base, Alaska. $20.00 postpaid in the USA.